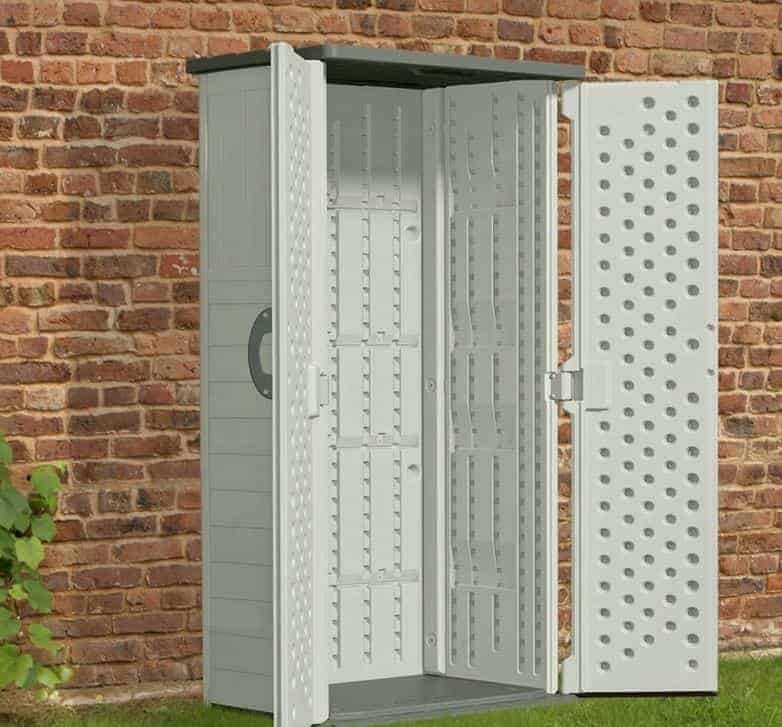 This compact storage unit is ideal for the keen gardener looking for a convenient place to stow their tools and equipment. It has a small footprint which means that it won’t look too obtrusive or take up too much space on the garden or patio, and yet due to its accommodating height it can fit much more inside than you might imagine. 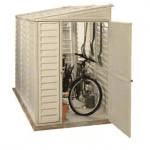 Convenience is a byword for this small shed, which is demonstrated by its no tool assembly method. This means that it’s incredibly easy to put together and yet once it’s installed it feels reassuringly strong and secure. Talking of security, you may want to add a padlock if you’re planning on keeping anything of particular value inside, so it was good to see that the handles are capable of accepting a lock and chain. Further reassurance is given by the cladding itself. Made of blow moulded twin-wall plastic it’s much tougher than you might imagine. It’s also weather resistant and completely maintenance and treatment free, so it really is a no worry addition to any garden environment. 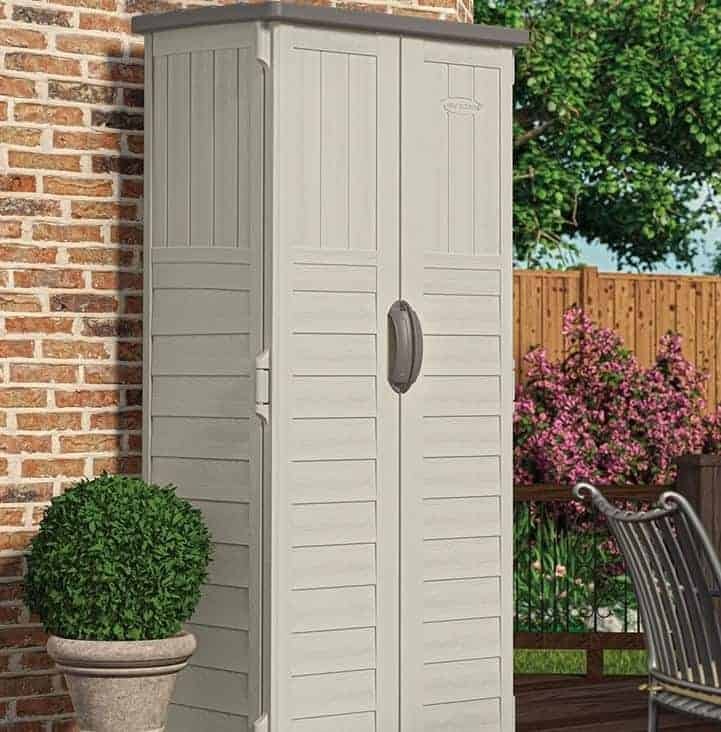 With a great value price tag attached too we can see this becoming a popular addition to many gardens, and it could easily be used alongside a more spacious shed or workshop. 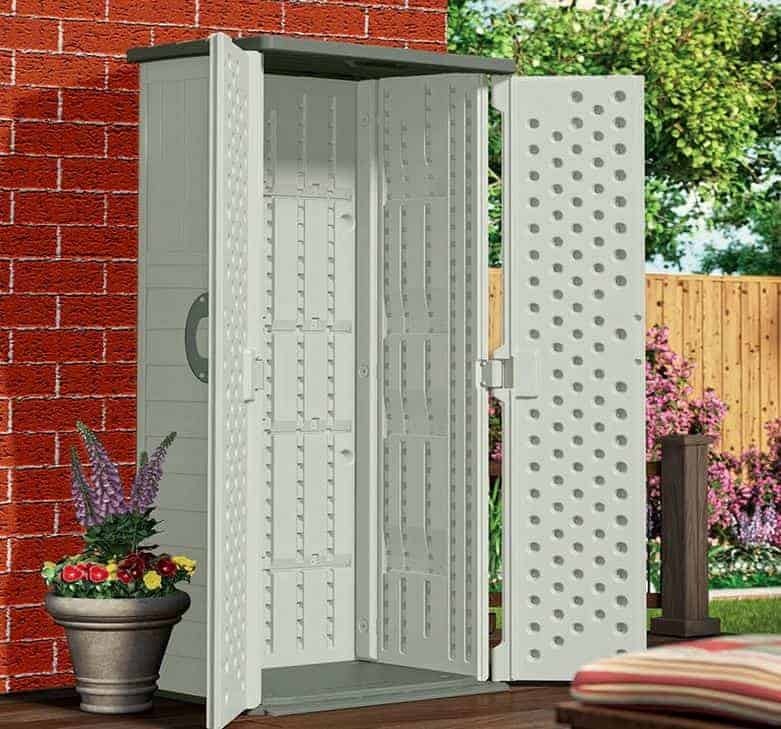 This plastic storage solution can double as a highly useful garden shed. 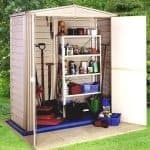 Any keen gardener knows how useful it is to have all the tools and equipment they need conveniently to hand, and this Suncast shed provides a great and relatively low cost way to achieve this. Despite its plastic nature we also found it quite pleasing to look at, thanks to its vanilla white colour scheme with dark grey detailing on the handles and the roof. 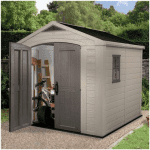 We feel that the compact nature of this shed is one of its greatest assets, as it means that people with very little space to spare on their garden can now have the advantages of a storage facility. Whilst it has a width of 0.82m and a depth of 0.65m, it has a height of 1.83m which equates to six foot. This is as tall as many garden sheds that we review, and the result is that a lot more can be stored inside than you might initially think. In fact, there’s a highly useful 22 cubic foot storage capacity. We were impressed at just how strong this storage shed feels once assembled, and that’s due to its high quality plastic cladding. It consists of blow moulded twin wall plastic, giving it twice as much strength as standard plastic cladding whilst also ensuring that it’s very easy to put together. We were pleased to see that it also features integral shelf supports. Whilst the shelves themselves are not included, finding a suitable piece of plastic or MDF will be easy and inexpensive. The thickness of the plastic resin cladding means that it’s very effective at keeping rainwater out, so you won’t have to worry about keeping the contents dry. We were pleased to see that it comes with a 10 year manufacturer’s warranty, as we know that this gives added peace of mind to customers, although in truth we wouldn’t be surprised to see it far outlast this warranty period. That’s because plastic is a very durable substrate, not prone to rot, rust or warping. This also means that there are no future treatment requirements for the customer, which will be especially welcomed by those who have had to endure the annual treatment cycles of some timber sheds. 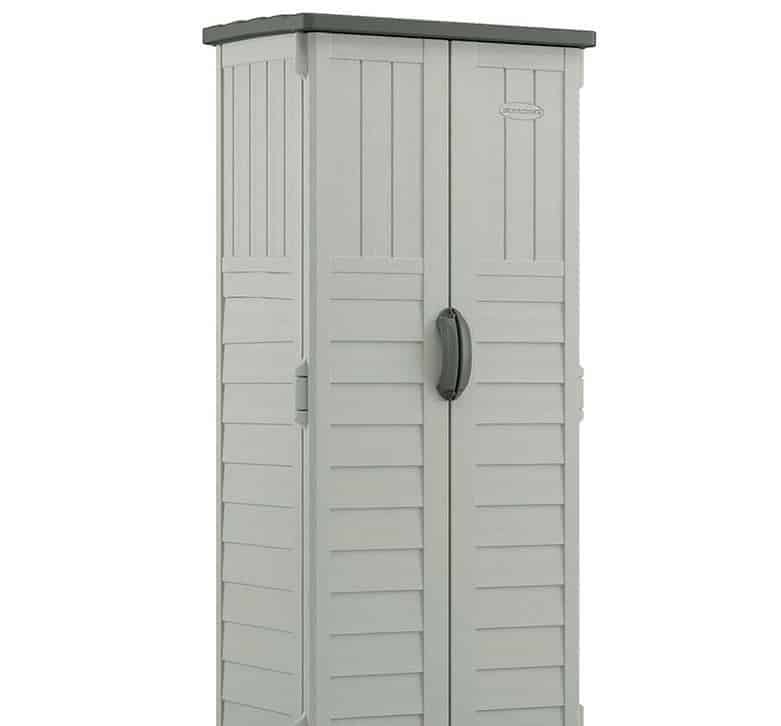 The moulded plastic double doors follow the design of the shed itself, in that whilst they are quite narrow they are also quite tall. They have an opening width of 0.69m and an opening height of 1.72m, which means that you won’t have to bend down too much when storing or retrieving items, and that it’s easy to get taller pieces of equipment such as a garden hoe or strimmer inside. There are no windows included, but nor would we expect there to be on a shed as compact as this, and when the doors are opened the shallowness of the interior means that it becomes adequately lit anyway. 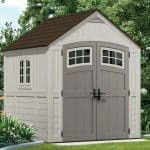 We always welcome the lack of windows for storage sheds, as it means that passers by and potential intruders have no way of seeing if anything of value is kept inside. That means that it’s much less likely that they will try to break into this shed, although we would still advise the addition of a lock if anything of particular value is to be stored within. That’s why it was good to see that the door handles have hollowed out middles, meaning that they can easily be chained together and then locked. As mentioned above, we feel that a padlock and chain would be a very useful feature for this shed. Whilst they aren’t included as standard they can be inexpensively purchased, and once in place just the sight of them can be enough to deter would be thieves from attempting to gain access. As mentioned earlier, shelving can also be added although this will need to be sourced and purchased separately. For such a compact and affordable shed, we were reassured by the quality displayed as shown by the use of twin-wall cladding. Cladding doesn’t come much more durable than this, which is why we feel the warranty period could have been even longer. 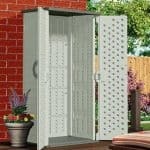 The accommodating height helps this shed achieve a 22 cubic foot storage space, which is ideal for a selection of garden tools. This couldn’t be easier to install, as it simply clips together without the need for any tools. This means that it can be achieved in much less than an hour, particularly if you have a friend to help. This garden building may be small, but it’s also very useful and durable too, so at a price of well under two hundred pounds we feel it represents good value for money. 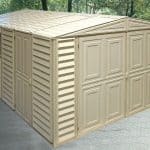 Final Thoughts: This isn’t a storage facility that will stand out obtrusively in your garden, or take up too much storage space that could be better used for other purposes. Rather, it will blend into the background ready to be called upon whenever you need to store or retrieve your tools. That makes it one of the simpler garden buildings that we’ve reviewed, but it doesn’t make it any less useful. We particularly liked just how easy it was to put together, and we know that will be appreciated by those who have very busy schedules or don’t like the idea of using tools for a self assembly project. Once up it’s surprisingly strong and durable, and we think it looks good too.